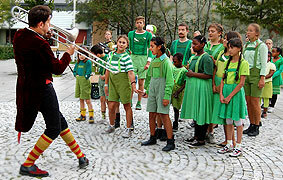 The Pied Piper from Vårby Gård was the Play from Vårby of 2011; it opened 18/8-2011. It was the seventh Play from Vårby arranged by Teater Slávas. The show played three times in Vårby Gård and once in Rosendals trädgårdar, a posh café at Djurgården in Stockholm. The Pied Piper from Vårby Gård was built on the fairytale about The Pied Piper from Hameln, but we added a happy end. 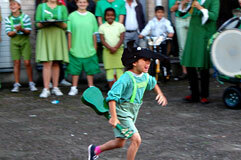 It was a wandering show, focused on the town itself, which played the lead role. The performance was a played in a very collective way. There was really just to roles, the Piper and the Mayor. The rest was citizens. It was a very musical show, where the music was playing, more or less, the whole time. It was everything from jazz and gipsy music to Beethoven and special designed music. The show met its audience with improvised music and the continued to the square in Vårby Gårds. A fountain became the execution ground, the fairground was on a plain close to the center och the big mounting where the children became looked in was a yard to the local youth club. The Pied Piper from Vårby Gård was just as much the process as its performance. 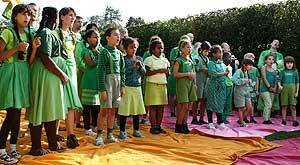 With an ensemble containing mostly children and where everybody did not speak Swedish the social part of the project was substantial. The joy and laughter from the rehearsals also spread into the show. The difference between shows in Vårby Gård and the one in Rosendals trädgårdar was great, both in how it was received and played. The Pied Piper from Vårby Gård was my second collaboration with Teater Sláva. It has been very hard work and very fun – hard work to work with such a big ensemble containing of so many kids , fun to work with such a skilled group. Off course it was also extremely fun with the kids too. The experience of Teater Sláva to work with this large groups and all this children has been a blessing. This entry was posted in Mickes's productions and tagged barnteater, blog, blogg, buffoon, buffoons, carnival, clown, clowns, comedy, commedia, fairytale, familjeföreställning, fixed masks, fools, Grimm, Klingvall, Kompani Komedi, mask, masks, Micke Klingvall, physical theatre, renaissance, rite, rites, rituals, scandinavian theatre, Slava, Teater Slava, theatre, theatre education, theatre school, theatre student, theatre teacher, ungdomsteater, Vårby gård, vulgar, vulgar comedy, women in comedy, women in theatre. Bookmark the permalink.